The very first time I visited Venice was with a tour group of 60-something-year-old English couples, treating themselves to the holiday of their lives, and my mother (treating her daughter to the sights and delights of Italy). I had some vague idea of a city built on water, of gondolas and of course gondoliers, of the fact that it was supposed to be romantic, though as an 11-year-old that mattered not a whit. We arrived in pouring rain, and woke the next morning to a lighter drizzle. What came next, however, changed Venice for me. My mother and I took a gondola ride. In the rain. With no umbrellas. With a gondolier who sang to us non-stop. Despite this, or perhaps because of it — I fell in love. With the city, with Italy, a country that embraced its amorous side so unabashedly, in fact with gusto and glee! I understood why romance defines this magical place. Years have passed and I have only visited once since, never taken a gondola again, but somehow Venice has retained its hold over my imagination. 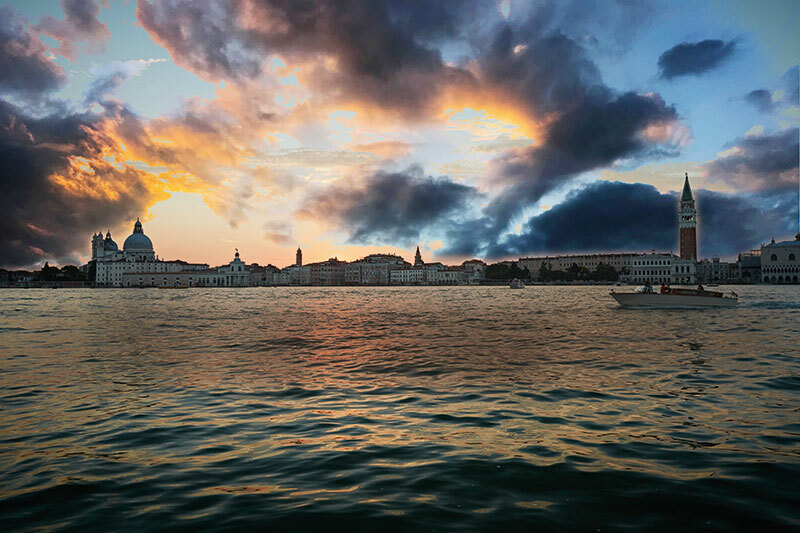 As an adult, I wanted an experience that took me deeper into the Venice that I thought I knew through my love for the paintings of Canaletto and John Singer Sargent. The majesty of Canaletto’s views of the Grand Canal, with the golden light of sunset and gold-topped flags fluttering on incoming ships, is an image that encapsulates Venice for me, as do the intimate paintings of Venetians engaged in their daily lives by Sargent made during his first Venice Period in the 1880s. 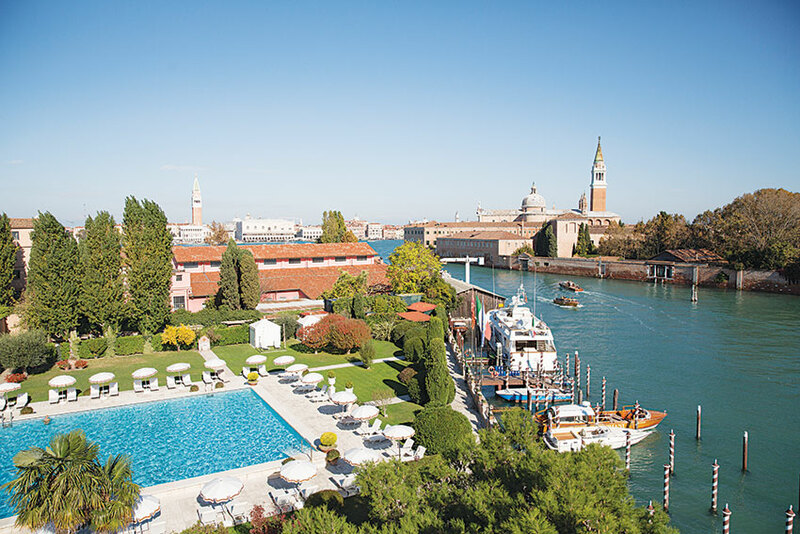 There are many classic must do’s in Venice, from the aforementioned gondola rides, to a drink at Harry’s Bar, a visit to the Rialto Bridge, and the Piazza San Marco at dawn or at midnight, but few as iconic as the grand Belmond Hotel Cipriani located on Giudecca island directly across the lagoon from San Marco. 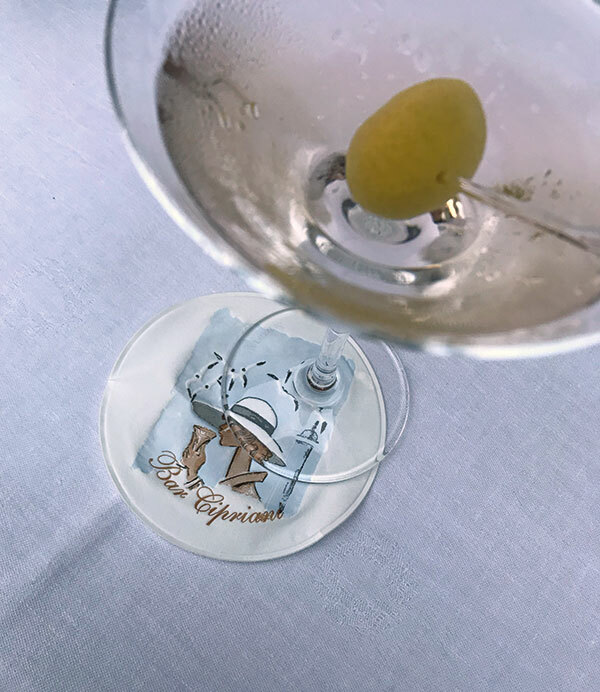 Built in the ’60s, it is the byword for elegance and chic, and steeped in history. There are few things more glamorous than one’s arrival into this breathtaking city. 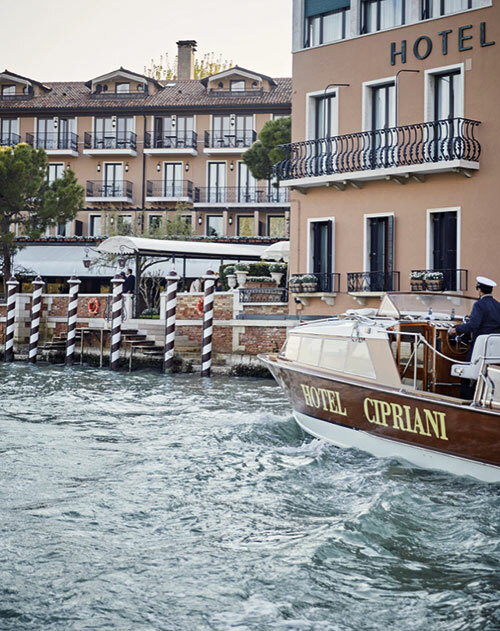 Ensconced in a wooden boat, making one’s way down the Grand Canal, hair flying in a warm breeze, dodging and weaving through boats, gondolas, clueless tourists, clued-in locals, and the public water buses…it feels like a movie, and arriving at the Cipriani hotel feels very much like the highlight. A splendid rose-coloured building, a grande dame, standing on its own island. I was greeted with much enthusiasm upon disembarking on their private dock. Gardens on either side of me, classic striped umbrellas swaying in the afternoon sun and a tinkling fountain — it was the perfect beginning to my few days exploring this city and the legend of the Cipriani. 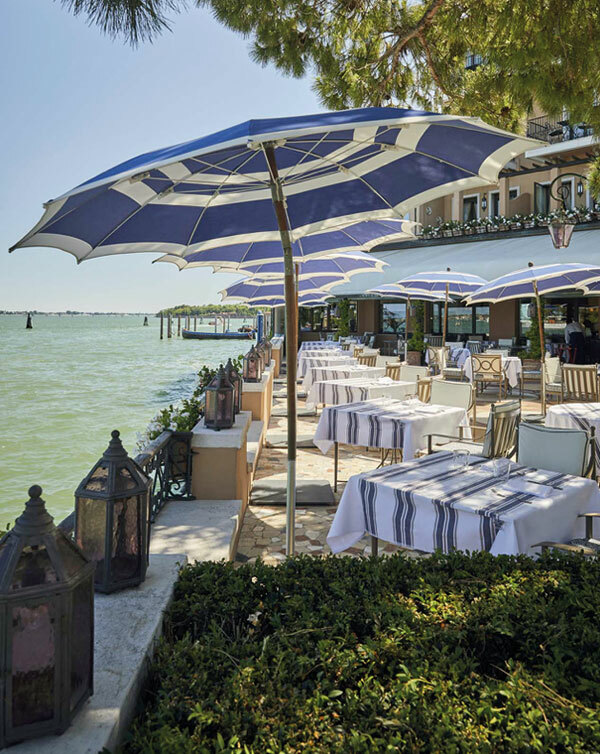 In 1956, Giuseppe Cipriani (founder of the much-loved Harry’s Bar and inventor of the classic cocktail, the Bellini) bought a three-acre plot on the tip of (the then-deserted) Guidecca island — just across from St. Mark’s Square. Close enough to be a five-minute boat ride from the city, and far enough from the bustle. Shortly after, the glamorous brigade of movie stars, minor and major nobility, Americans flush with cash, English aristos, various artists and authors started to arrive, establishing this wonderful hotel as a luxurious private escape. As with every place with a rich history, stories abound and my favourite one about the Cipriani centres around the swimming pool. Legend has it the imposing Olympic-size pool is as large as it is due to a miscommunication pertaining to metres versus feet. The Guinness sisters (who were the backers) had specified the measurements as 25 by 50 feet. Giuseppe made it 25 by 50 metres, and so it remains as it was built, this magnificent, oversized, saltwater pool on an island in a lagoon! One of the best things about the Cipriani is that it feels like many things at the same time. Grand hotel to luxuriate in, island hideaway for a much-needed break, a moment to reconnect with nature in its vast gardens, (Guidecca was famed as the gardens of Venice complete with a convent where noble families would send their daughters) impressive pool to spend the day at, and perfect access to the sights of the city. There is also the actual history of the hotel, with its tales of celebrities and architecture, and its restaurants, strategically placed at the most beautiful vantage points of the island. The food is excellent, but oh my — the views! From Cip’s Club (one of its three restaurants) one looks out over the expanse of water towards the Piazza San Marco and the domed beauty that is the church of Santa Maria della Salute (roughly translated as St. Mary’s of health and deliverance) built as an offering during the devastating plague of 1591. On the night we arrived, the Cipriani was celebrating its 60th anniversary (a year-long celebration this year with many events planned). Walking into Cip’s Club just before sunset, we watched the sky turn a stunning peach, and then as a grand surprise the fighter jets zoomed overhead trailing the red, white and green of the Italian flag. Seeing the streaks of colour fill the sky over the San Marco silhouetted against the sunset brought a sense of awe to the moment. Dinner was delicious, the best Italian food is not fussy but simple…the ingredients speak for themselves and all three of the restaurants (including the Michelin-starred Oro, and the more casual Giudecca 10) at the Cipriani stay true to that school of thought. 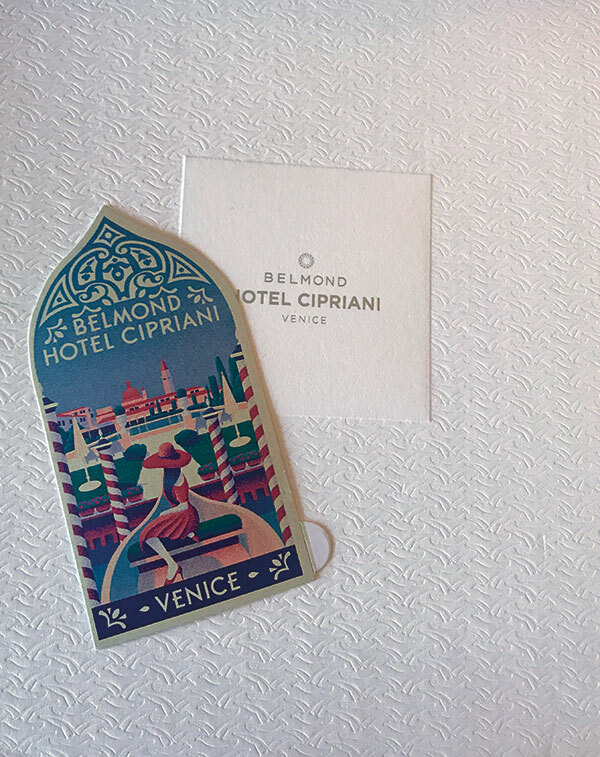 For such a majestic hotel with such a storied past, the Cipriani feels very intimate. Even more so as the level of personal attention is among the best I have ever experienced. After a brief conversation with the sommelier in residence, the brilliant Alessandro Pugliese, about Italian wines, I found myself the happy participant in a small wine tour aboard the Edipo Ré the next day. This 16-metre wooden stunner is the original boat belonging to the famous film director Pier Paolo Pasolini, in which he took many a journey with his greatest love and renowned opera singer, Maria Callas. We set off to tour the lesser-known hidden corners of the lagoon with the aforementioned Pugliese, the boat captain and his assistant and a vast array of wines, delicious Italian cheeses, pastas and artichokes. 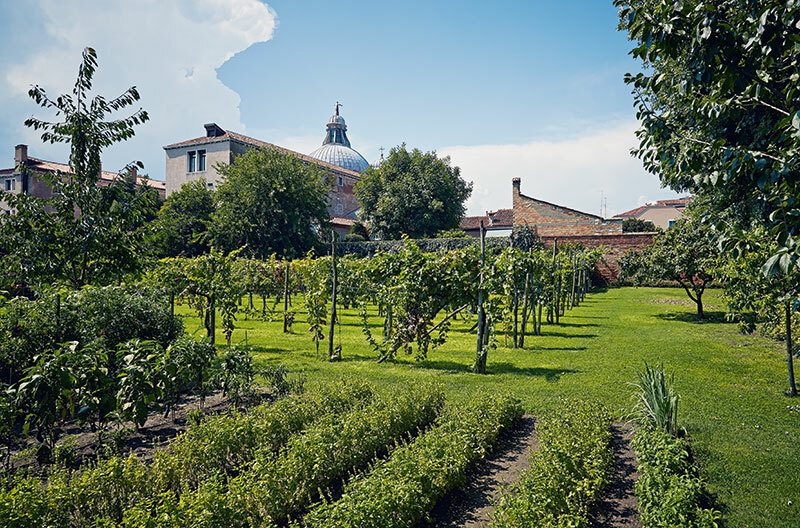 On a sunny day that was perfect for the four-hour trip, we ventured out to Torcello (where a 7th-century cathedral resides) and to Pellestrina (a narrow strip of an island barely 200 metres long), accompanied by a wine tasting of Italy’s most unusual wines. Starting with a Lambrusco, followed by a Malvasia (a delicious Sicilian white), and a truly wonderful one from Aosta Valley (which is Italy’s coldest region), ending with a local bottle of the regional Valpolicella wine, all the while also taking in the sights. There ahead was Poveglia island (with an abandoned hospital and land belonging to the city of Venice which they refuse to sell to any of the many hotel groups who hanker after this exquisite spot), to the left a centuries-old San Francesco Monastery with 12 monks still in residence along with 4,000 cypress trees. 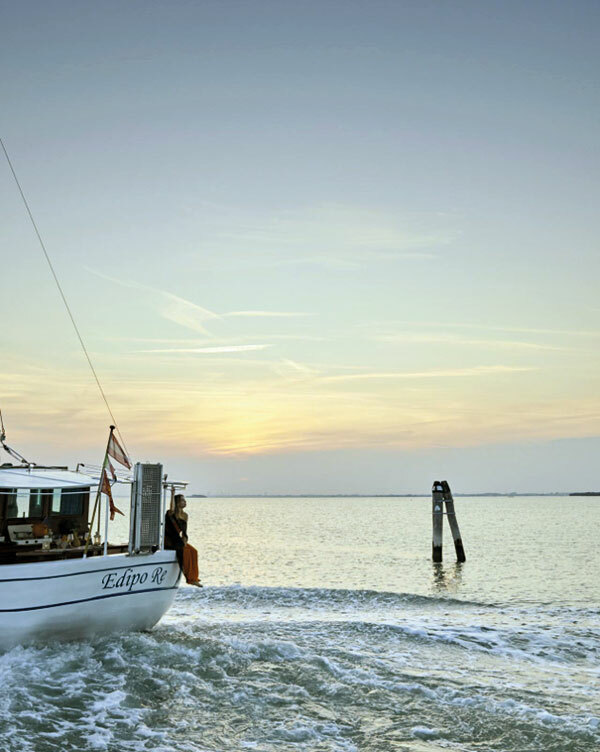 A few metres ahead, we sail by the Lido with its beautiful homes and 12-kilometre-long beach where the locals congregate every weekend…and head back towards the Cipriani with all of Venice laid out ahead of us. The wonder of the Cipriani also lies in the fact that despite its most famous guests (George Clooney, Princess Diana, Paul McCartney and other assorted stars) it still retains a warmth that makes ordinary folk feel extraordinary. It also exudes the aura of a closely kept secret to be shared only with one’s nearest friends, lest it becomes overcrowded. In Venice it is almost impossible to get away from the crowds, they seem to populate every nook and cranny of this city. Finding respite becomes very important and along with the magical Peggy Guggenheim Collection (former home of the fabulous Peggy Guggenheim), the island of San Giorgio Maggiore with its bell tower and stunning 360-degree view of the city and the Isola di San Michele (Venice’s cemetery), there are the gardens and grounds of the Cipriani. Venice has its secrets, and it will take much more than a few visits to unearth them, but the promise of this beautiful spot as my haven from which to venture forth will ensure my return, for years to come.